The question tugs at me do have a hope of healing the planet when we’re so woeful at healing ourselves, our missteps, and our own hurt feelings. What if we healed our personal environment first? What if we brought our whole selves to make a whole Earth? Gratitude is a fundamental attitude and practice in most every spiritual orientation. Being grateful benefits you, the ones to whom you are thankful, and, by spreading positive energy, the whole world. 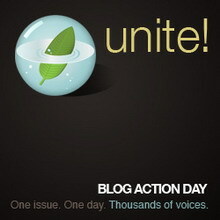 So, for Blog Action Day, I offer this suggestion: make the world a better place by making today a day to remember your gratitude. Sometimes, we forget to say thank you. We get too busy, and miss opportunities to speak our gratitude. Sometimes we -- I -- even take people, gifts and blessings for granted. Teachers/Guides/Coaches: Adam Kayce, Cynthia Loy Darst, Jeff Herring, Joanna Rueter, Linda Heron Wind, Mark Silver. Healers/Physicians: Ceidlin Beller, Deeanne Bevin, Kathy DiMartino & Mary Anne Green, Kori Tolbert, Mary Coan, May Johnstone, Stephanie Bartlett, Walt Fritz. Without your care, I would not be as well and alive as I am. Fat Activists/Size Acceptance Leaders: The entire Board of ASDAH; Marilyn Wann, Miriam Berg, Paul Campos, Paul Ernsberger, Barbara Bruno, Jon Robison; and all the wise women of the Fat Poets' Society. Loving Friends: Auntie Susie, Bev & Larry H., Diana R., Diane H., Dylan E., Janice R., Jody F., Jody L., Jonesie, Karen A., Marcia N., Michele S., Mike E., Paula B., PegE., Ruth B., Sharlene C-L, Terry E., Tracy S.
My Support Team, who keep me sane: Ann B. And Nancy K.
To My Beloved Clients: A promise of confidentiality means no names here; know that you each have taught me much, and blessed my life by sharing yours. Last but very much not least, my family: Hubby Elliot, and son Dan & DIL Leigh. Also, mother, mother in-law, siblings, siblings-in-law, and niblings too numerous to name. 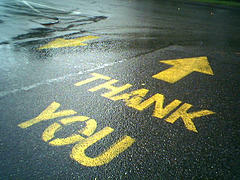 Dear reader, who is waiting to hear "thank you" from you? Don't wait for your birthday -- they, you, and the planet deserve --and need -- your gratitude today. Photo from Flikr.com by psd. Thank YOU for your beautiful words. Gratitude can be a wonderful gift, a way of connecting and of honoring. My thanks to you for your kindness, your wisdom, and your strong spirit and sense of self! Bless you, and happiest of (belated) birthdays! We would love your help sharing the word and message of www.theiamgratefulproject.org shifting people into a space of gratitude! Peace be with you.